Let me set the scene for you: It’s 6pm. The sun is just beginning to set over Far North Queensland. The Townsville temperature is sitting at 29°C, but in the shade, it’s a slight bit cooler. Surrounded by tropical plantation and chirping cockatiels, you sit down and dip your feet in the pool. The water is still warm from the days sun, but not so much that it’s not soothing. Then, you crack it; the perfect beer, for the perfect evening. An involuntary “ahhh” escapes your lips. This is the life. It can’t get much better than this. The Hassle Hop is one of Burleigh’s “A Bit on the Side” brews, meaning it’s not regularly in rotation like their Hef, 28 Pale Ale, and My Wife’s Bitter, but sweet baby Jesus, I wish it was. From the first moment I poured, I knew I was in for something special. A rich, thick, light beige head spewed up, and I was hit with a barrage of fruit aromas including rockmelon, citrus fruits, and a hint of caramel for good measure. This head sat around in the glass for the whole duration of the 650ml bottle that I put down, so I was always greeted with that pleasant scent with each mouthful. The beer is a 5.5% Pale Ale. According to the bottle, the idea behind the beer was that after debating their favourite hops, the 5 brewers decided to put all 5 of them in. Being as it would be hard to balance out the flavours of Galaxy, Citra, El Dorado, Belma, and Mosaic, the name Hassle Hop arose. Even with my little knowledge of hops, I know at least a few of those have some pretty distinctive flavours, and making a beer that was hopped so heavily and still make it easy to drink… well, that’s a bit of a task. This beer ticks those boxes wonderfully. It does have a strong hop profile to it, don’t get me wrong, however it’s balanced out nicely with a sweetness from the malt and a light alcohol flavour that sits just in the background. The bitterness hangs around on the tongue for a little bit, but not to the point where you require a bowl of pretzels to get rid of it. It sits, it lingers, it disappears. This beer was so good, I had to go to Dan Murphy’s to grab another. 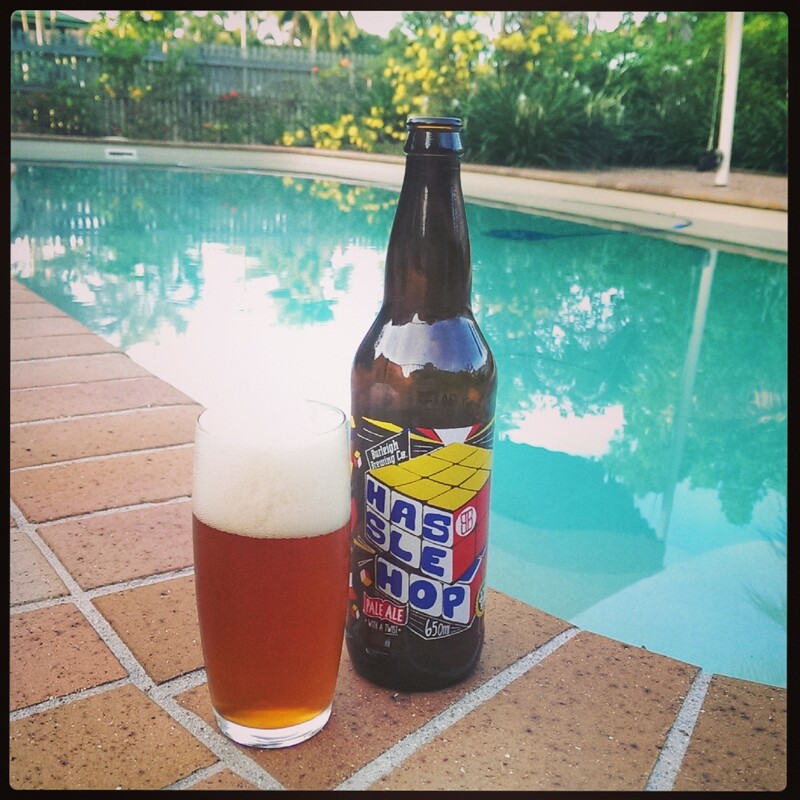 Lucky for me, Townsville isn’t as switched on to what good beer is, so there were still a few left. I may even go up and clean out their remaining stock. I don’t usually repeat beers when there is choice, and (if you’ve been following my blog) I don’t really review individual beers either. But this beer made me stand up and make exceptions. I can see why it made it to number 38 on the top 100 beers of 2013. I’m a bit late to the table when it comes to this beer, but for my sake, it’s better late then never. So if you’re out shopping for something tasty and you come across this little gem, grab it while you can. Limited releases are, well, limited. My hopes are that, with it’s popularity, the Hassle Hop becomes an annually brewed beer, so that more and more Australians can sit back, pop one open, and enjoy that “ah” moment. Thanks for your kind words – we’re stoked you love the Hassle Hop as much as we do!